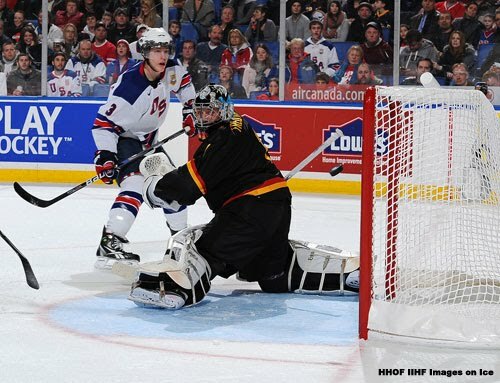 Charlie Coyle’s second multi-point game of the World Junior Championships helped Team USA blank Germany, 4-0, in Buffalo. The Terrier freshman center staked the Americans to a 1-0 first-period lead with a rush to the net and quick wrist shot from close in. Coyle, who has five points in two games to lead all U.S. scorers, also assisted on Chris Kreider’s power play goal in the second period and earned U.S. player of the game honors. Team USA takes on Switzerland tonight before advancing to the medal round. Terriers are in Illinois for the Shillelagh Tournament hosted by Notre Dame at the Sears Center in Hoffman Estates. BU takes on Brown tomorrow afternoon at 3 p.m. CT, followed by Minnesota State playing the Irish. American One Broadband will be live streaming all four games of the tournament on the Internet. Cost is $10 per day (2 games each day). Details are here. 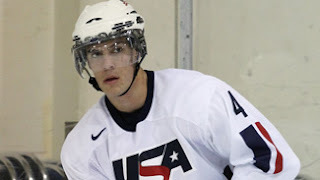 2013 recruit Matt Grzelcyk has three assists for Team USA in the first two games of the World U17 Challenge with one in the 5-2 win over Finland and a pair in the 4-1 victory over Germany. Rick DiPietro stopped 37 shots in the Islanders’ 2-1 shootout win over the Penguins. DiPietro made saves on two shots by Sidney Crosby, whose 25-game scoring streak was ended. San Jose placed John McCarthy on injured reserve with an upper body injury. Kevin Shattenkirk escaped serious injury when he took a puck to the forehead in Monday's Avs-Redwings game. He played 16 minutes last night in the Avs' 4-3 shootout win over Edmonton. Kevin Schaeffer assisted on the third-period tying goal for Las Vegas in the Outlaws’ 4-3 shootout win over Stockton in ECHL action. Schaeffer has four points in 22 games this season. New England Hockey Journal looks at Hockey East teams at the season’s midpoint. Freshman Charlie Coyle assisted on Team USA’s first two goals and the roofed a power play goal for 3-0 lead, as the U.S. skated past Slovakia, 6-1, in the World Junior Championships preliminary roundlast night. His goal-mouth pass to Kyle Palmier (Anaheim Ducks) four minutes into the first period got the defending WJC champs off to a fast start and they never looked back. Hockey scout Dan Sallows evaluates 2011 recruit Alexx Privitera and conducts a Q&A interview with the Muskegon Lumberjacks' top bluliner. Last week we reported Rick Meagher’s selection as one the top 50 all-time ECAC players. Blog contributor mh82 sent us this 1989 article about how the Terrier scoring star became captain of the St. Louis blues and one of the NHL’s top defensive forwards. The Hockey News’ John Grigg has Kevin Shattenkirk at the top of his current list of Calder Trophy candidates. Goal-less in his first 21 starts this season, former BU co-captain and Hobey Baker Award winner Matt Gilroy scored twice to lead the Rangers past their local rivals, the Islanders last night, 7-2. Gilroy, who has been in and out of the New York lineup this season, but has registered a +10 in his past 13 starts, scored 44 seconds into the game--assisted by BU's other Hobey Baker Award winner, Chris Drury. Then, in the second period, he broke a 2-2 tie with a wrist shot (video) that knuckled past former Lowell goalie Dwayne Roloson. Drury had two assists. Even when I sat him out and we played the other six, we didn’t feel he was that far away., Right now I think he is one of our six (defensemen). He has hung in there and done the right things to be ready to play and has taken advantage of the opportunity. The Terriers return to action on New Year's Day, taking on Brown in the first round of the Shillelagh Tournament at the Sears Center in Hoffman Estates, outside of Chicago. BU, who will meet either Notre Dame or Minnesota State in the second round, will be bolstered by the return of junior co-captain Chris Connolly who missed the past five games with a broken bone in his hand. The Terriers will have a full contigent of blueliners available, too. Last week we incorrectly reported that Adam Clendening had been injured during a Junior National Team exhibition game against the Czech Republic. He did limp off the ice after block a shot but returned to action and didn't miss any shifts. BU will be without Charlie Coyle, who is on the U.S. team in the World Junior Championships in Buffalo. Team USA, which edged Finland, 3-2 in overtime on Sunday, returns to action tonight, taking on Slovakia in an 8 p.m. ET start that will air on the NHL Network. • USA Hockey's WJC blog. The BU Alumni Association invites alums, family and friends to a pre-game reception at the Sears Center on Saturday. The reception begins at 1:30 p.m. with puck-drop set for 3:05 p.m.
Hockeysfuture.com profiles Terrier freshman Matt Nieto in its ongoing series on 2011 draft prospects. WTBU Sports’ Chris Aliano takes a crack at what Coach Jack Parker might be wishing for as the Terriers enter the second half of the regular season. Former Terriers Brian Strait and John Curry, currently with the Wilkes Barre/Scranton Penguins will be at Pittsburgh new Consul Energy Center this Thursday taking on the Hershey Bears as part of the undercard for this season’s NHL Winter Classic matching the Penguins and Capitals on New Year’s Day at Heinz Field in Pittsburgh. • Former Terrier standout Rick Meagher was among those named in the ECAC’s latest installment of the 50 top players in the conference’s 50 year history. BU was an ECAC member until it became a charter member of Hockey East in 1984-85. One of the most dynamic players to ever don a BU sweater, Meagher is the program’s only three-time first-team All-American. A member of the BU Sports Hall of Fame, he scored 90 goals and 120 assists powering BU to four consecutive ECAC titles (1974-77) and four trips to the NCAA Final Four. 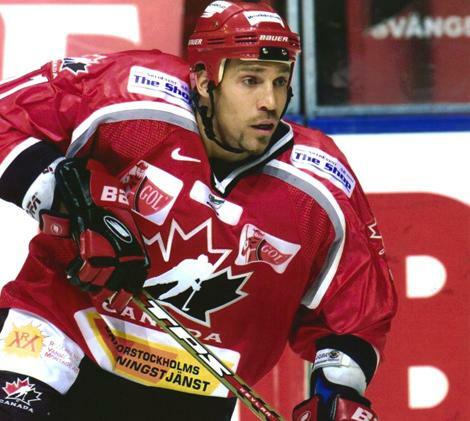 The Belleville, Ont., native played nearly 700 games in the NHL, mostly with St. Louis, New Jersey and Hartford and won the NHL's Selke Award as top defensive forward in 1990. Meagher currently is an amateur scout for the Blues. • Two members of BU’s 1995 national championship team, Tom Noble and Mike Sylvia, have joined the coaching staff of their high school alma mater, Catholic Memorial, assisting coach Bill Hanson. Noble who was in goal for BU’s 6-2 win over Maine in the 1995 title game, is working with the Knights’ goalie Tommy Knox, who, ESPN Boston, reports is a BU recruiting target. Sylvia, who scored BU’s fifth goal in the ’95 title game, rang up 54 goals and 120 points in his Terrier career. • Another BU-CM connection is Knights senior defenseman Marc Hetnik Jr., whose father, Marc Hetnik, was a forward for BU in the late 70s and scored 37 points for the 1978 national champs. The younger Hetnik, who anchors the Knight’s defense and was named to the Boston Herald’s pre-season Dream Team picked up three assists Tuesday night on the rink where his father played for the Terriers in CM’s 4-1 win over Needham. • Wednesday night, CM played St. Sebastian’s at Harvard’s Bright Skating Center in the annual Kevin Mutch Memorial Game between the two schools. Mutch, who played for St. Sebastian's and later for BU, was killed in a 1992 automobile accident after one year of coaching. St. Seb’s cruised to a 6-0 led by a pair of goals from Danny O’Regan, whose father, Tom O’Regan, co-captained the 1982-83 Terriers and later played in the NHL and in Europe. • Earlier this week we reported that Head Coach Jack Parker attended last weekend’s Malden Catholic-Delbarton game. According to ESPN Boston, BU is among five Eastern college recruiting MC junior forward Brendan Collier. Beyond the Dashers' Hockey East correspondent Al Daniel offers a midseason assessment of the Terrier women's team. Boasting the number 4 ranked offense in Women's D1 and an undefeated freshman goalie, Kerrin Sperry, Coach Brian Durocher's team enters second semester a point behind BC in Hockey East and ranked number 3 in the national poll. Freshman Charlie Coyle will be donning a USA sweater once again as he was named to the Junior National Team that will defend its World Junior Championship title in Buffalo next week. Coyle assisted on the second goal for Team USA in its 3-2 shootout loss to the Czech Republic in the squad’s second exhibition game in Rochester last night. Last year, Coyle skated for U.S. Under-18 Select team in Slovakia and the Four Nations Cup in Finland. Terrier freshmen Adam Clendening and Matt Nieto were among the final cuts from the roster which was made public today. Clendening, a native of the Buffalo area, was injured during the Czech exhibition game and didn't play the final period and a half. We'll post further news about his injury when it is available. The World Junior Championships begin on Sunday, Dec. 26, (schedule) with the NHL network carrying all of the U.S. team’s games, starting with Sunday evening’s matchup with Finland. Terrier co-captain David Warsofsky was on last season's U.S. squad which defeated Canada in overtime for the gold medal. One of the things in the summer when we were talking about the team is that we're going to be young down the middle. Charlie actually came to us and we weren't sure if he was going to be a centerman or not at BU. We tried him down the middle at Lake Placid and he was just outstanding. He's big, he's strong, he's extremely smart. He's reliable defensively and he can make plays offensively. He had a great camp for us in Lake Placid, and then he went to BU and really kind of took over that first-line center role for Coach Parker. He's had a good fall there. He's a guy we're going to rely on heavily, and we really like him as a hockey player. Nick Bonino’s return to Boston Garden Monday night was a painful one, despite the Duck’s 3-0 shutout of the Bruins. The former Terrier standout forward suffered a bone bruise to his right foot while blocking a shot. X-rays were negative, but Bonino will be sidelined for a while. His return to Agganis Arena, where Anaheim practiced the previous day, was more enjoyable. Blogging for the Los Angeles Times, teammate George Parros, who played college hockey for Princeton in ancient Hobey Baker Arena, didn’t hide his enthusiasm for the BU facilities. The team practiced Sunday in Agganis Arena, home of college hockey's Boston University Terriers and former home of our very own Nick Bonino. They just built this new arena for the team, and it is incredible. Their weight room dwarfs any hockey- specific weight room that I have seen before. Their locker room was NHL-quality, and their lounge was ahead of the game, complete with its own ping-pong arena. I was quite jealous of their ping-pong table and was surprised to see that Mr. Bonino is apparently a Hall of Fame ping-pong player (his name was still on the dry erase board -- third on the all-time list). Looks like we will have to have a showdown somewhere along the way this year. I'm taking bets now. Bleaching Report has moved Kevin Shattenkirk to its #2 ranking among Calder Trophy candidates as the NHL’s top rookie. Ryan Whitney registered his 25th assist of the season in Edmonton’s 3-2 loss to San Jose. A 2010 U.S. Olympian, the former Terrier blueliner is 6th in the NHL in helpers and has the most of any defenseman. USHR Reports that both Terrier Coach Jack Parker and longtime rival Jerry York of BC were in the crowd at when local high school powerhouse Malden Catholic took on—and defeated— defending New Jersey state champ Delbarton at Malden Valley Forum on Saturday. Yahoo! Canada Sports reporter Neate Sager reports that defenseman Michael Matheson, one of the most highly sought after recruits, is closing in on a decision about his future as a college hockey player. Matheson, who plays for the Lac St. Louis Lions (Midget AAA) in Quebec—the same program that advanced the careers of injured BU freshman Yasin Cissé and Harvard’s Biega brothers, recently visited Dubuque, Iowa, where the Dubuque Saints hold his USHL rights. After letting the QMJHL—which was prepared to make him the #1 pick in last Spring’s draft—know he is intent on playing NCAA hockey, Matheson is weighing his options. 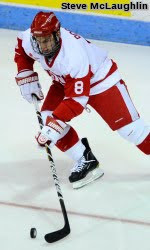 He has been offered by BC and Vermont for next season and by BU for 2012, which would follow a season with the Saints. Freshman goalie Kerrin Sperry has been added to the roster of the 2010 USA Hockey Women’s Winter Training Camp next week in Blaine, Minn.
Once February arrived, the '90-'91 squad pushed its game into high gear. They thumped BC, 8-4, to win the Beanpot, then beat Maine, 4-3 in overtime on Shawn McEachern’s breakaway goal (video) to win the Hockey Championship. The post-season push took them past Michigan and Clarkson to the National Championship game against Northern Michigan, which the Terriers lost, 8-7 in 3 OTs, just moments after a McEachern shot hit both posts. Following a four-year career at BU that produced 77 goals and 179 points (7th best on the all-time BU list), Tomlinson played 42 games for three NHL teams before going on to become a high-scoring standout in Europe, including six season with the Mannheim Eagles. This year the North Vancouver, B.C., native became the radio analyst for Canucks broadcasts. You can hear him on Canucks games, which are live streamed. Q. Dave, since this is the 20th anniversary of the 90-91 team that came ¼-inch from a national title, let’s start with that team and the championship game vs. Northern Michigan. That was a team that many BU fans feel was among the best squads not to win a national title and certainly among the most talented. Have you watched the entire game on tape? A. I’ve seen parts of the game but not the full game in its entirety. It is pretty painful to think about how close we came to winning it all. After being up after the first period there were thoughts of closing in on a National Championship, and after battling back after being down late in the game, it was almost like it was meant to be…but the puck never made its way across the line and we came up short. It was an emotional roller-coaster for sure, and a game I’ll never forget being a part of. Q. Once BU tied the score late in the third period, how confident were you that BU would win in overtime? A. Well, with all the talent on that team, and such a great, tight group of seniors, it was almost like someone was certainly going to be the hero on our side. I remember Tony Amonte being almost unstoppable in that game. David Sacco was the guy that tallied the equalizer with the goalie pulled, and, in between the third period and overtime, there was talk of getting it over early. Obviously that wasn’t the case as the game went into the third overtime, and I remember the goal against like it was yesterday! It would have been a fantastic way to cap off my college hockey career, but it did remind me of how hard it is to win championships, which is something I carried through my pro career…not wanting to experience that losing feeling again in a final. Q. How do you think the 90-91 team stacks up against the teams that won national titles in 1995 and 2009? 2012 recruit Robert Polesello got the fireworks going a minute into the Vaughan-Dixie OJHL game with his 12th goal of the season. He added a pair of assists in the Vipers 9-2 win. Freshmen Charlie Coyle, Adam Clendening (photo) and Matt Nieto began final tryout camp Friday for the U.S. Junior National team that will defend its World Junior Championship later this month in Buffalo. The squad’s first exhibition is tomorrow against Rennselaer in Troy, NY. 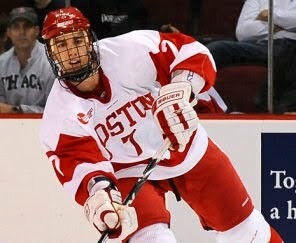 • NHL.com’s Mike Morreale examines how tryout camp brings BU and BC rivals together as teammates. New England Hockey Journal examines former Terrier and NHL standout Tony Amonte's return to Thayer Academy as head coach. Amonte is one of three ex-Terriers beginning careers as New England Prep coaches. Longtime NHL players Shawn McEachern and Scott Young are the news coaches at The Rivers School and St. Mark's respectively. Amonte and fellow South Shore native Jeremy Roenick starred for Thayer in the late 1980s. With last night's 3-2 win over St. Andrew's, Thayer has a 3-2 record. Amonte and McEachern were members of BU's 1990-91 Final Four squad, which celebrates its 20th anniversary this season. Highlights of that season are being posted on our This Date in Terrier Hockey page and tomorrow we'll post a Q&A interview with one of that team's standout scorers, Dave Tomlinson. Another former Terrier, Dan Donato, is behind the bench for a New England prep school. Donato, who played professional baseball in the Yankees' and Devil Rays' organizations, is in his fourth year at The Dexter School, where his varsity roster includes Mark Fidler and Trevor Fidler, sons of former BU standout Mark Fidler. Kevin Shattenkirk assisted on two goals in Colorado’s 6-5 overtime win over Ottawa. Shattenkirk now has five goals and 14 assists in 21 games since his recall from Lake Erie and has emerged as Calder Trophy candidate. He’s tied for 12th in scoring by defensemen. Thursday night at Madison Square Garden, Adrian Aucoin’s first goal of the season helped Phoenix to a 3-2 lead over the Rangers, but Chris Drury won a key offensive-zone faceoff leading to the tying goal late in the third period in a game New York won in overtime, 4-3. Sean Sullivan’s assist in Worcester’s 3-2 overtime loss to Connecticut gave him 19 points for the season, seventh best among AHL scorers. Alexx Privitera’s power play goal brought Muskegon to within a goal of Tri-City late in the third period, but an empty netter closed out the Lumberjacks, 4-2. The goal was the sixth of the season for the USHL’s top-scoring defenseman. USA Hockey has named Terrier strength and conditioning coach Mike Boyle to the same position for the U.S. Women’s National Program. 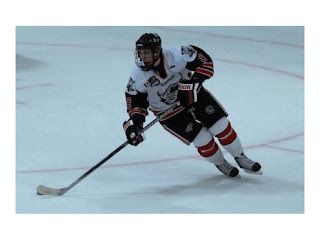 NHL Central Scouting accidentally listed [2011 recruit] Cason Hohmann as 6'2" 192 lbs., in their first list. If he really was that big, and played the way he does, he'd maybe be the top overall pick in the draft. As it is, he's listed at 5'8" 160 lbs, which makes him far less attractive as a draft candidate. Hohmann was a kid that I thought was great at age 15, but start to fade as he got older and the competition got better, but to his credit, he's still the same playmaking waterbug that he's always been. Just sensational hands and always made a solid play any time he touched the puck. He should be an excellent college player at BU. And finally '95--late '95, even--[2014 recruit] Anthony DeAngelo is the youngest player in the USHL this year. He's an absolutely incredible skater for his age, so much so, that you sometimes forget how old he is when his decision-making with the puck isn't quite at the same level. It's good to see him pushed like in the USHL though. Against AAA competition, he could skate his way out of a lot of difficult situations, whereas here, he'll have to learn how to be better with the puck. It's tough to compare him against some of the other top '95s I've seen, since he's playing such a tougher level of competition, but he's certainly among the top of his age group. Colin Wilson's goal with 2:32 remaining in the third period was the game-winner in Nashville's 3-2 victory over San Jose. For Wilson, who earned the game's top star, it was his seventh goal of the season and third in the past five games. Video clip. John Curry stopped 29 shots in a 2-1 overtime win for Wilkes Barre Scranton over Abbottsford. Curry improved his record to 11-4. Chris Drury returned to the New York Rangers' lineup after missing 31 games with a broken finger. 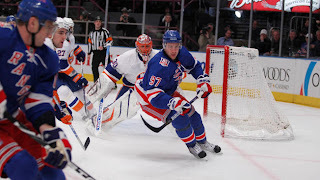 The former Hobey Baker Award winner had 14 minutes of ice time in New York's 4-1 win over Pittsburgh. The Terrier Women’s team achieved the highest ranking in the program’s six-year history, moving up two notches to #3 in the country. Coach Brian Durocher’s squad, riding a six-game winning streak, finished the semester at 14-2-3. The team’s co-scoring leaders each earned Hockey East honors. Jenn Wakefield with 2 goals and 2 assists was conference Player of the Week and Marie-Philip Poulin with three goals was named Rookie of the Week. Terriers finished the semester on a down note, losing to Rensselaer, 4-1. The Engineers did all their damage on special teams, with three power play goals and a shorthander. RPI took a 3-0 lead early in the second period. Wade Megan's goal, assisted by Ryan Ruikka, narrowed the gap, but BU's efforts to come back were stymied by RPI goalie Allen York. Alexx Priviterra, the top-scoring USHL defenseman with 18 points, registered his 5th goal in Muskegon's 5-2 loss to Omaha. 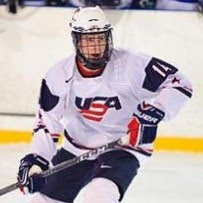 2013 recruit Adam Erne tallied a goal and an assist in a 6-2 Indiana win over the NTDP U17s. Fellow recruit Matt Grzelczyk had an assist for the U17s. BU completes its first semester schedule traveling to Troy, N.Y. for an afternoon contest against 15th ranked Rensselaer (8-4-3). The Engineers have won four of their last five games, most recently a 6-2 win over Brown. The 3:30 p.m. start, which will air live on NHL Network and Time-Warner cable, is the 65th meeting since the series began in 1953 with BU holding a 33-28-3 edge. In 27 previous games at Houston Field House, BU has a 13-12-2 record. RPI’s top scorer is Chase Polocek with 20 points. Goalie Allen York ranks seventh nationally with a 1.90 GAA. Grant Rollheiser gets the start in goal for BU, who may be without forward Ross Gaudet. If he’s unable to play, Kevin Gilroy will be in the linup. Freshman Sahir Gill enters the game on an eight-game scoring streak. Terriers assistant coach Buddy Powers will be returning to Houston Field House where he coached RPI from 1989-94. 2013 recruit Adam Erne’s power play goal late in the third period was the game winner for Indiana, which edged Chicago 3-2. 2012 recruit Robert Polesello scored a goal and an assist in Vaughan’s 6-3 loss to Villanova in OJHL action. It was Polesello’s 11th goal in 16 games. Led by a goal and two assists by Jenn Wakefield and a pair of goals from Marie-Philip Poulin, the Terriers beat Harvard, 5-3, at Bright Hockey Center. Jillian Kirchner and Jill Cardella also scored for 4/5-ranked BU which finishes the semester with a 14-2-3 mark. Both Wakefield and Poulin now have scored 15 goals for the Terriers who have outscored their opponents, 67-32. 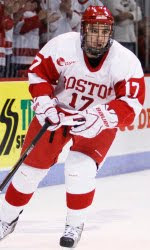 BU has added a forward, who according one scout ““oozes offensive skills,” to its 2011 recruit class. U.S. Hockey Report says that Evan Rodrigues, a 5’10”, 170 right wing from the Georgetown Raiders (OPJHL), has committed to BU for next season. Last month, Rodrigues (photo by Izak Westgat) played in the World Junior A Challenge where he was he was the top scorer for Canada East and co-leader overall in the World Junior A Challenge (3-4-7 in five games). Canada East, whose roster also included 2012 BU recruit Robert Polesello (who had three assists for Vaughan on Monday), lost in the tournament final to Team USA and fellow 2011 recruit Cason Hohmann. Rodrigues was named to the tournament all-star team. Two nights ago, playing in the CJHL Top Prospects tournament in Dauphin, Manitoba, Rodrigues, who was one of only seven OJHL players on NHL Central Scouting’s players to watch list, scored a goal and an assist in Team East’s 7-1 win. Last night, he was named Team East's player of the game in a 2-1 shootout win. In Rodrigues’ first Junior A season, he had 20 goals and added 31 assists in 56 games played. This year's he’s tallied12-21-33 line in 20 games and has been on the score sheet in 16 games. Rodrigues has really good hands, a high skill level, is excellent on the power play, and has a lot of offensive upside – just very good natural offensive instincts. He’s a good skater, though not a waterbug type. A comparable player on the current BU squad would be Sahir Gill, in that he’s not necessarily the type that NHL guys get excited over, but projects to be a fine college player. Michigan and Notre Dame were other schools seeking Rodrigues’ verbal. • The Daily Free Press recaps last night’s 5-4 win against Northeastern. • USCHO grades the Hockey East teams as the semester break approaches. • BU’s next opponent is Rensallear in a Saturday afternoon game (3:30 p.m. start) that will air on the NHL Network. The Troy Record previews the matchup between the Terriers and Engineers. Alex Chiasson's power play goal off a slick Charley Coyle feed late in the third period was the difference in BU's 5-4 over a persistent Northeastern team. The Huskies harrassed a slow-starting Terrier team to grab an early 2-0 lead, but the Terriers rallied to tie the game on goals by Coyle and Ryan Santana--who scored his first career goal at BU. 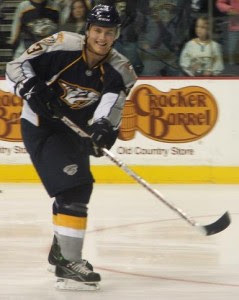 Colin Wilson scored his sixth goal of the season in Nashville's 3-2 win over Detroit. The former Terrier All-American has found the net three times in the past four games. Pete MacArthur scored his third of the season in San Antonio's 5-2 win over Chicago in AHL action. John Curry stopped 17 of 18 shots in Wilkes Barre/Scranton's 5-1 win. Check out today's post on THIS DATE IN BU HOCKEY. With the Terriers anxious to put the past weekend’s loss in the rearview mirror, a midweek game may have come at an opportune time. With Northeastern visiting Agganis Arena tonight, BU must put its focus on the next game rather than the last ones. After winning only one of its first ten games (1-7-2), the Huskies have been more competitive lately, going 2-1-2 in the last five and coming off a 2-1 win over Merrimack. Tonight's game is the 207th in the series with Northeastern, the only team BU has played more than BC. Since the series began in 1930-31, BU holds a 147-51-8 (.733) advantage. Scott McLaughlin of The Boston Hockey Blog offers his predictions on the final roster of the U.S. Junior National Team that will defend the World Junior Championship title won last year with David Warsofsky on the blue line. The Terrier Women's team recorded its second consecutive shutout--and third in five games--blanking Northeastern, 3-0, at Walter Brown Arena last night. Goals by Holly Lorms, Jenn Wakefield and Marie-Philip Poulin back perfect goaltending by Kerrin Sperry, who raised her record to 10-0-2. Next up for the 13-2-3 Terriers is a matchup with Harvard on Friday, a 7 p.m. road game. Not surprisingly, Hockey East’s Weekly release had almost no Terriers on the list of top performers. Matt Nieto with goals in each of the two BC games was the only one to earn the recognition. The Terriers fell to #7 in the polls following back-to-back losses to BC. The roster for the final Jr. National team evaluation camp was announced today. Charlie Coyle, Adam Clendening and Nieto all were named to the roster. Training camp begins Dec. 16 in Albany and the first exhibition game is Dec. 23. against Norway. The World Junior Championships begin Dec. 26 in Buffalo. The PureHockey on Campus online radio program airs tonight at 7 p.m. ET with guests including RPI coach Seth Appert, USA Hockey’s Keith Allain and College Hockey News editor Adam Wodon. Longtime Voice of Terrier Hockey Bernie Corbett and former Princeton standout Paul McNamara co-host. Kevin Shattenkirk's scoring streak continues to make him a hot topic in Avalanche hockey circles. He talked with the Denver Post's Adrian Dater about hockey career beginning on ponds in Rye, New York and later at the N.Y. Rangers' practice facility at Rye Playland, all of which led to the U.S. NTDP program and then his three seasons at BU. Colin Wilson's fifth goal of the season (video) and an assist got the Predators off and running in a 3-2 win against Atlanta. The #5-ranked BU women’s team takes on Northeastern tonight in a Hockey East matchup at Walter Brown Arena. The Terriers are currently in second place in the conference with a 4-1-3 record, overall 12-2-3. A shorthanded goal in the second period and a breakaway goal in the third enabled BC to pull away from the Terriers for a 5-2 win to complete a sweep of BU. Matt Nieto (photo) gave the Terriers an early 1-0 lead, but the Eagles tied the score late in the first period, then scored two early second-period goals. Co-captain Joe Pereira narrowed the margin to 3-2 in the second period, but that was as close as the Terriers would get. Nieto's two goals over the weekend doubled his season total, hopefully signalling a breakout for the freshman speedster. It was a much better effort from BU than Friday's disappointing performance, but BC's speed and pressuring defense created numerous grade A chances for the Eagles. Kevin Shattenkirk's point-scoring streak continues as the blueliner had two assists in Colorado's 6-5 loss to Tampa Bay. The Avs trailed 6-3 late in the third when Brandon Yip's sixth of the season (video) narrowed the lead to 6-4. Shattenkirk's second assist on a Milan Hejduk goal cut it to 6-5. Shattenkirk now has a 4-10-14 lines in 15 games since his call-up from Lake Erie. John Curry improved his record to 9-2 and lowered his GAA to 2.26, stopping 24 shots in Wilkes Barre/Scranton’s 3-2 win over Adirondack. Brian Strait’s +10 leads all of the Baby Pens defensemen. 2011 recruit Matt O'Connor stopped 29 of 32 shots in Youngstown's 4-3 win against the NTDP U18s. 2012 recruit Robert Polesello scored his 10th goal in 17 games in Vaughan's 5-3 win against St. Michael's in OPJHL play. Polesello, who has 21 points for the Vipers and has scored in 13 of 17 games, was the youngest player on the Canada East squad last month in the World Junior A Challenge. Scoring twice in the game’s opening minutes and once late in the first period, BC seized control of last night’s first meeting of the season between the Terriers and their archrivals and dominated the first 40 minutes en route to a 9-5 win before a sold-out Agganis Arena. The silver linings for the Terriers were very few. One was that the power play got untracked somewhat with 3 goals in 15 attempts. Also three players who had been a bit snake-bit lately, Matt Nieto, Andrew Glass and Max Nicastro (photo) all scored for BU. Nicastro's goal was his first of the season. Kieran Millan, who gave up three first-period goals on 13 shots, was relieved by Grant Rolleheiser, who played the final 40 minutes. Last night’s game aside, sophomore Alex Chiasson is thoroughly enjoying his hockey and academic experience at BU, describing it for James D’Amanda in an installment of USHL Alumni Voices. The St. Augustin, Quebec, native led BU freshmen scorers last season with 19 points and is the co-leader this year with 13 points, tied with Sahir Gill and David Warsofsky. Kevin Shattenkirk’s scoring streak reached eight games with his assist on Colorado’s lone goal in a 2-1 loss to Carolina. 2011 recruit Cason Hohmann scored the overtime game-winner in Cedar Rapids' 3-2 win against Chicago. Hohmann has eight goals in 13 games on just 33 shots for a .242 percentage. 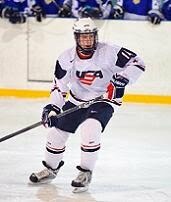 2013 recruit Matt Grzelczk assisted on the NTDP U17s' first goal in a 4-3 shootout win against Lincoln. The defenseman has four points--all assists--on the season. Lac St. Louis defenseman Michael Mattheson , a top prospect from Quebec, who visited BU during the Oct. 30 game against Lowell, talked with The Hockey News about his decision to play college hockey rather than Major Junior. He has narrowed his choices to BU, BC, Northeastern and Vermont. Game Day--Terriers and Eagles continue The Battle of Comm. Ave. In the series between the longtime Comm. Ave. rivals, the Terriers lead, 125-108-17 (.534). The teams are an even 5-5-2 in their last 12 meetings, but BU has won five of the last seven. • Goalie Kieran Millan joins women’s basketball player Alex Young to present the weekend schedule of Terrier sports for Scarlet Daily Digest . Millan (photo), who will be in goal tonight, has a 5-2-1 career record and a 2.48 GAA vs. BC. • GoTerriers.com has links to game notes, gametracker, and the radio Webcast on WWZN. John McCarthy had ten-plus minutes of ice time in last night’s San Jose 4-0 win against Ottawa. He didn’t make the score sheet, but was part of a likely unique circumstance following on the heels of yesterday’s USA Today article on the growing presence of college players in the NHL. Nine of the Sharks’ 18 skaters were former college players and interestingly, six of them—McCarthy (BU) Benn Ferriero (BC), Doug Murray (Cornell), Dan Boyle (Miami), Mike Moore (Princeton) and Justin Braun (UMass)—played four seasons of college hockey. The other Sharks who are ex-collegians: Joe Pavelski (Wisconsin), Torrey Mitchell (Vermont) and Danny Heatley (Wisconsin). USA Hockey will announce the invitees to its World Junior Selection Camp next Tuesday. Charlie Coyle, Matt Nieto and Adam Clendening are all expected to be invited. The Western Hockey Blog takes a stab at those likely to make the final roster. Boston University Alumni Network of Greater Philadelphia is holding an ice hockey watch party for Saturday’s BU-BC game, 7:30 p.m., at Conte Forum. The event is at Fox & Hound 1501 Spruce Street, Philadelphia. Register here. For other out-of-towners, both Friday's and Saturday's games with the Eagles will air on CBS College Sports. USA Today reports that college hockey has become an increasingly significant pipeline to the NHL; 225 of the 789 players (28.5%) who have played at least one game this season are former college players. Among colleges, BU has had the fourth most former players in the NHL this season with 15. Matt Gilroy, Colin Wilson, Brandon Yip, John McCarthy and Nick Bonino all made their NHL debuts last season. Kevin Shattenkirk and Colby Cohen joined the club this season. Kevin Shattenkirk’s early success with the Avalanche continues to draw attention. He’s featured The Hockey News’ Rookie Report and Cheapseats.ca’s NHL Fantasy Watch. Colin Wilson (photo) scored his fourth goal of the season for Nashville in a 4-3 shootout win over Columbus, 4-3. Former Terrier MVP and All-American John Curry stopped 21shots in Wilkes Barre/Scranton's 5-1 rout of Albany. Former BU defenseman Bill LeBlond, a member of the Terriers' 1978 NCAA championship team, is the new coach at Cape Elizabeth High School in Maine. LeBlond (photo), who returns to coaching after a 16 year layoff, coached Scarborough to the state's Class B title in 1995. His assistant at Cape Elizabeth is former Maine standout Barrett Heisten. We have two more THIS DATE IN TERRIER HOCKEY installments-- one each for the 1990-91 team, this year marking the 30th anniversary of its run to the national championship game and the 1970-71 team that won BU’s first title 40 years ago. The Daily Free Press previews Saturday’s conference matchup with Connecticut, the team the Terriers beat in overtime last Spring to win their first Hockey East championship. ESPN hockey analyst John Buccigross, a youth hockey advocate who also coaches his son’s pee wee team, talked about recent changes to U.S. hockey programs at the earliest levels, with former Terrier forward and assistant coach Kenny Rausch, now USA Hockey’s manager of youth hockey. Rausch, a walk-on speedster who became a fan favorite and an important cog on three Terrier Frozen Four teams—including the ’95 NCAA champs, had been an assistant coach at BU, Niagara and Lowell, before joining USA Hockey. At BU, he played both forward and defense. In his senior season, he scored the game-winning overtime goal against Minnesota in the Mariucci Classic, earned MVP honors in the final Beanpot Tournament played at the old Boston Garden and was named a Hockey East Distinguished Scholar. Defensemen David Warsofsky and Garrett Noonan made the list of top performers in the last Hockey East Weekly release which includes national and conference individual and team statistics. USCHO’s Hockey East Blog analyzed the up-and-down season of BU’s next opponent, arch-rival Boston College, who despite four conference losses, is tied with the Terriers for first place in Hockey East. Jay Pandolfo, four games into his AHL season with the Springfield Falcons, talked with New England Hockey Journal about the challenge of trying to stay in shape on your own, waiting for a team to call. The Boston Globe’s Fluto Shinzawa reports on the Bruins’ acquisition of Colby Cohen. The Daily Free Press recapped the women’s team’s sweep of Princeton. Freshman goal Kerrin Sperry, sporting an 8-0-2 record and a 1.58 goals against average, was named co-winner of Hockey East’s Rookie of the Month for November. Former Terrier All-American Colby Cohen was acquired by the Boston Bruins today from the Colorado Avalanche in return for defenseman Matt Hunwick. Cohen, who scored BU’s game-winning goal in overtime in the 2009 national championship game and led BU with 11 power play goals last season, will report to the Bruins’ AHL affiliate in Providence. The trade ends a long run of Cohen and Kevin Shattenkirk being teammates or at least in the same organization. The two had been teammates on the East Coast Selects and then in the U.S. NTDP program in Ann Arbor, before their three years at BU and signing with Colorado. Meanwhile, Shattenkirk talks with The Denver Post about his early success in Colorado. His backdoor pass to Milan Hedjuk for a goal against Dallas on Nov. 20 earned him the Avalanche Play of the Week. The Daily Free Press offers a feature on Ben Rosen, who scored his first goal in Saturday’s tie with Brown, along with a game recap. This week’s national ranking have BU remaining in the second spot in the USCHO poll, while dropping to third in the USA Today/USA Hockey Magazine poll. We added another post on our THIS DATE IN TERRIER HOCKEY page about the 1970-71 season. One of our readers has pointed out a similarity between the 1970-71 squad that won BU's first national championship and the most recent NCAA champs in 2009. Both teams had ended the previous season with a disappointing loss in the their conference tournament semifinals--to Clarkson on a goal in the final minute of in the ECACs in 1970 and to Vermont in the Hockey East tourney in 2008--and both used the loss as part of the motivation for what would be a record-setting season. The 1970-71 team rang up a then-record 28 wins and 210 goals scored, while the 2008-09 team won a record seven championships. A slow start in the first period and a strong performance from Brown goalie Mike Clemente were two obstacles the Terriers overcame in gaining a come-from-behind tie with Brown, 4-4 in overtime, despite outshooting the Bears, 42-43 and having some grade A chance late in the third period and in the extra stanza. The good news was that BU came back from 2-0 deficit; the bad news was not closing out a game the Terriers led 3-2 late in the second period. As USCHO's Scott Weighart put it, "It was the best of ties, it was the worst of ties." Sophomore Ben Rosen (photo) scored his first career goal in the first period, which was followed by goals from Joe Pereira and Alex Chiasson in the second period. Wade Megan's third-period marker knotted the score at four apiece. The Terriers, who will meet Brown again in the Shillelagh Tournament in Chicago on New Year's Day, return to conference play with the annual December home-and-home series against arch-rival Boston College. Both games will air on CBS College Sports. Kevin Shattenkirk scored his fourth goal (video) in 12 games and added two assists (4-6-10) in the Colorado's 7-4 win over Minnesota. Goalie Matt O'Connor stopped 19 shots in Youngstown's 3-1 win against Chicago in USHL action. made 23 stops as the team improved its record to 11-2-3. Terriers are home for the holiday, taking on Brown University in the first matchup between the teams since BU’s 8-1 win at Walter Brown Arena in November 1997. The Bruins, who opened the hockey community’s eyes with a strong run in last Spring’s ECAC playoffs where they upset RPI and Yale, are coming off a milestone weekend, having beaten Cornell and Colgate on the road for the first time in 18 years. Brown’s strength is its power play which has been clicking at 28.1 percent. Chris Connolly’s broken pinky and excessive penalties by Sean Escobedo have led to several lineup changes. Andrew Glass moves up to left wing on the third line with Ross Gaudet and Wade Megan. 6-4 freshman defenseman Patrick MacGregor makes his collegiate debut tonight, paired with sophomore Max Nicastro. Last season, MacGregor played for New England Prep Champion Avon Old Farms. • GoTerriers.com has links to game notes, gametracker, the WWZN Radio Webcast and the All Access video Webcast. • Boston Hockey Blog game preview. BHB will be live blogging tonight. For the Scarlet Daily Digest, Scott Weighart traces the circuitous route that brought junior Chris Connolly from Duluth, Minn., to Commonwealth Avenue and a national championship in his freshman season. After several season of junior hockey, Connolly, whose younger brother Jack stars for hometown Minnesota-Duluth, caught the eye of then Terrier Associate Head Coach David Quinn at the 2007 USHL Fall Festival. Check out our THIS DATE IN TERRIER HOCKEY page. Today we begin posting some of the games from the 1970-71 season, as we mark the 40th anniversary of BU's first national championship team. We'll also be posting some articles with recollections of some of the players and coaches of that squad that went 28-2-1. The #5 ranked Women’s team skated past visiting Princeton last night, 8-2, with a balanced attack led by Jenelle Kohanchuk’s goal and two assists and a pair of goals by Jillian Kirchner. The women’s team takes on Princeton again today, this time on the sheet at Agganis Arena, for a 3 p.m. start as part of Ivy Saturday that sees both hockey teams and the men’s basketball team (vs. Cornell) playing Ivy League schools.